The day started after introductions of our cook, Suri, and our driver, Vincent. It was a very long drive through Arusha and beyond. The roads were nice and smooth for the most part, however, every now and then the road was being renovated and we were going to get an ‘African Massage’ (ride on the gravel road). Along the way, we were both very surprised to see Maasai people and their huts. Basically, outside any major town, the Maasai populate any open space, living in an archaic round mud hut. The huts these people live in are also very interesting. We learned that the dung used for building the straw huts is used as an anti-malarial agent. 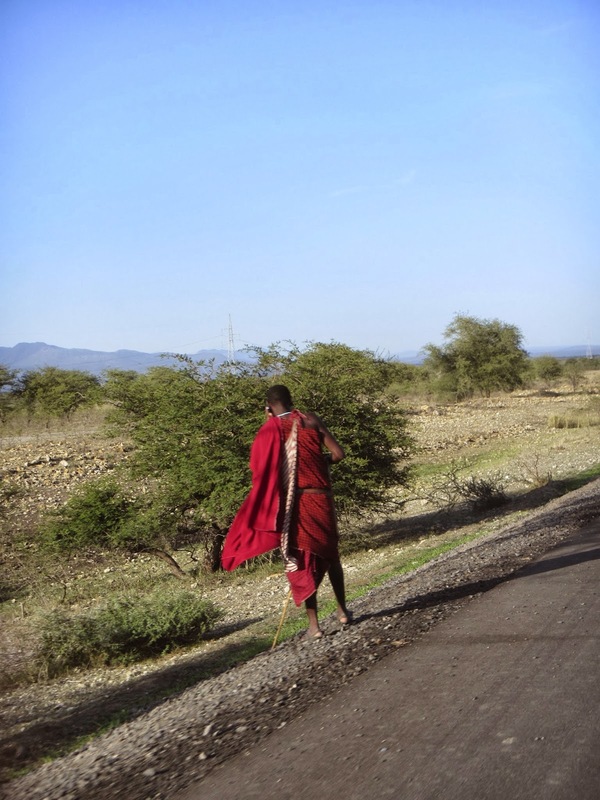 The Maasai people wear traditional red or purple plaid robes and are mostly seen herding goats and cattle along the highway. Kids only 5 years old were responsible for most of these herds. Ben and I contemplated what an experiment it would be to put a North American 5 year old in a room with a Maasai 5 year old. Slowly, the Tanzanian government is building schools for these kids. It will be interesting to see how that plays out in the communities down the road. Every bump we had to slow for, however, was met with a group of kids begging for money. It was very sad to see – habits gained from other tourists and it’s longterm effect. Yup…we were on top of that a few days ago! 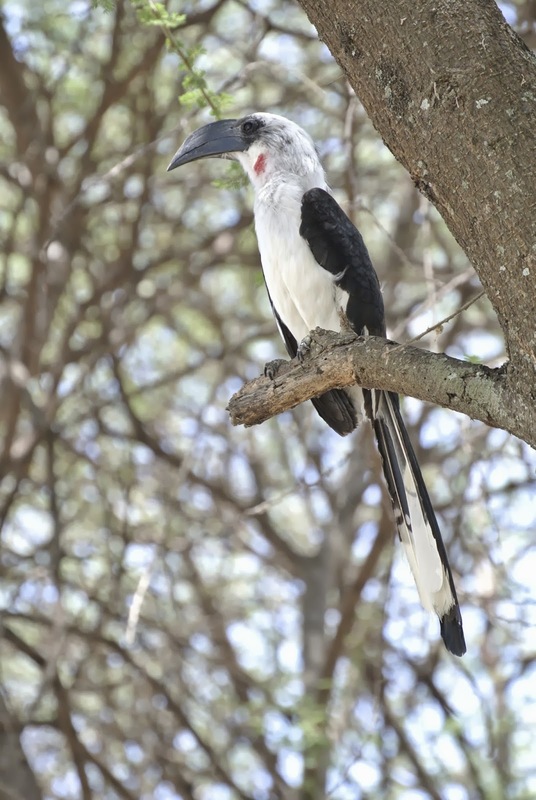 Eventually, we arrived at Tarangire National Park (NP). This park is known for elephants – guaranteed sighting. After a few hours, we had arrived and lunch was given to us at the park gate, while we awaited clearance into the park. The drive then started and we truly learnt the meaning of ‘safari’ – binoculars in hand and searching for movement, dust, anything! We were not disappointed as we spotted our first grouping of baboons, warthogs (pumba) and gazelles. The park was quiet from vehicles and the animals were initially hard to come by. Soon enough, however, the vehicle became surrounded by many elephants. The first three elephants seen resulted in a paparazzi moment, I’d taken a number of photos from every angle – including the large fifth leg (Ben was shocked I took that one…hehe). Shortly thereafter, there were hundreds seen. We saw them crossing streams, blocking our pathway on the road, big ones, little ones, eating ones, and ones scratching their bum on the tree. This elephant was not happy with us…we had to stop. This male wanted to confront us. Babies everywhere. Funny how warthogs need to kneel to eat. 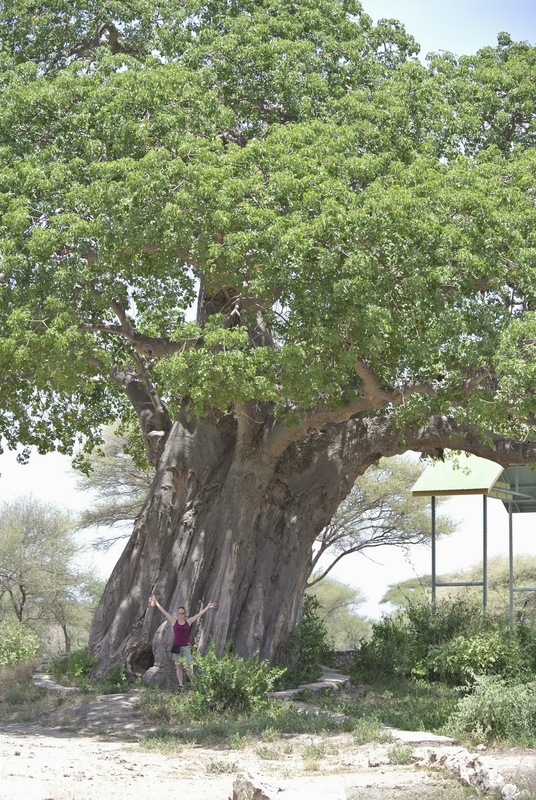 The baobab trees in Tarangire NP were out of this world. They are soooo big and stagger through the landscape, making for some unreal photos. We saw a lot of wildlife here – giraffes, elephants, tons of birds, warthogs, Thompson’s gazelle, monkeys, but noticeably absent were the viewings of large cats, hippos, rhinos, hyenas and wildebeest. Forget name, but apparently these are really hard to find. After a few hours of gazing through our hard-topped roof on the Toyota truck, we closed up and headed back to our lodging. We rolled into a fenced area and into a...public campsite. Both Ben and I were not impressed. Vincent told us to take a shower while we awaited dinner and camp set-up. Unfortunately, we did not have a towel, who brings a towel to ‘luxury camping’?! Haha…Daniel went and bought us one to share. Oh…we screwed up the lodging for this booking. Guess budget camping to tenting are very different and unless you know the difference to ask for, it will be mistaken. The bathrooms were public and personally, I thought they were disgusting. Glad I could hang my toiletries and use my sandals. Many of the older women there were confused as well – shocked over shared gender showering arrangements. Guess a group of us missed the memo! Oh well…we’re here for the animals right?! No wild animals walking by the tent sites tonight though! The day started as usual, bright and early. Suri made us the usual breakfast we’ve grown accustomed to here – porridge and eggs with toast and hot-dogs. Shortly thereafter, we loaded the vehicle and headed off to Ndutu on the way to the Serengeti. Again the drive was good with the occasional bumpiness…more "African massage". Our first stop was less than an hour away at the Ngorongoro NP gate. Here we stopped for more paperwork. During the waiting, we looked at the information centre for 3D representation of the area. While I was in the bathroom, Ben was waiting by the vehicle. Over 30 Baboons walked down the middle of the street. Right up to tourists and vehicles. It was quite a sight to see! Every time we stopped, Daniel would remind us to close the windows so that the Baboons wouldn’t steal our snacks and food. After obtaining the correct paperwork, we arrived at the Ngorongoro Crater view-point. Apparently getting a good view without clouds is a rarity and so we took the opportunity to snap a few pictures. This crater is 19km wide and up to 610m high, and full of wildlife that we’d meet in a couple of days on our way back to Moshi. The drive after the crater was beautiful, once we left the rim of the crater itself. There were lush rolling hills with wildlife all around us. This is the only place were herds of cattle can co-exist with lions and other predators in one location. We were told it was due to co-habitation for so long. The Maasai people were walking everywhere as well. Sometimes, we would see people walking far away in the field from who-knows-where to who-knows-where. Continuing on this trek, we found giraffes, zebras, and the rare wildebeest (mixed with cattle…odd site). Seriously, Ben thought dressing this way was a publicity stunt (to get money out of him in the form of tips), but this is the norm outside of towns! Shortly after leaving the crater rim, we came across the migrating Wildebeest. There were thousands (maybe millions) of these animals running through the fields and across our road. Words cannot describe the size of the migration…they literally blacked out miles of miles of the open plain. Baby Wildebeest nestled against their mommas. Occasionally we’d find a lost baby and watch as it reunited with its momma in glee. We followed the migration for a few kilometers and then it was lunchtime. The crew found us a random tree in the middle of the migration. 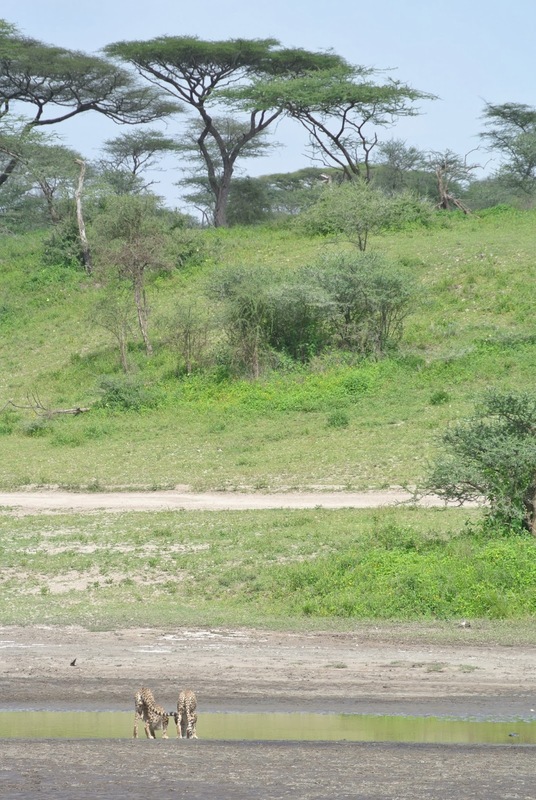 We parked the truck and sat eating our lunch in the field, watching the Wildebeest watching us and then running away. This was definitely a very memorable experience. 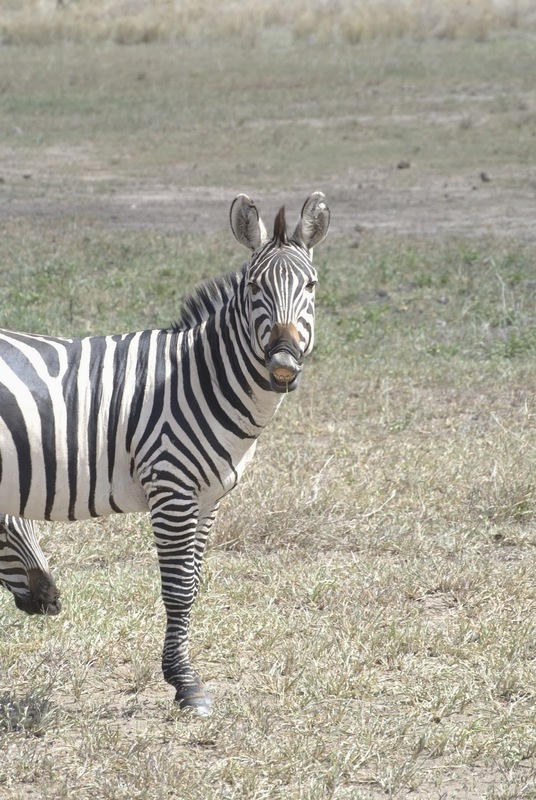 Zebras also migrated with the Wildebeest, apparently because one is good with sounds, one with scent, and they act synergistically in survival, in this way. This was a good lunch moment. Finally we made it to Ndutu. There is a Ngorongoro and a Serengeti side to the Ndutu region. This park was both Ben’s and my favorite (but Ben really liked the Crater). Ben asked for this as an add-on, given the area’s high reviews on Trip Advisor. It did not disappoint. The first big view was Lake Massic that was full of flamingos. Pink was everywhere, but the flying flamingo is where you saw the real colours emerge. The colours resembled some outfit I’d like to wear at some slick and fancy outing in the city. We then saw 11 lions chilling in the open, 1 hyena digesting its food on the cool ground by the water and endless Wildebeest and Zebras. Ben kept thinking we were spoken to as kids, when our guides called the lions 'Simba' and the warthogs 'Pumba' - I had to explain these are swahili terms. LOL. He was pretty embarrassed. As we drove away from the lions, a truck of French tourists got stuck in the dirt. They couldn’t get out themselves and so we witnessed a four-vehicle tow of the truck. All the tourists watched in amazement. Guess this is how they do it in the desert! In the distant, two cheetahs could be seen slinking their way through the landscape. Ben and I were quite nervous that our long stop would mean a miss of this elusive animal…but Vincent bee-lined it there in a hurry. We saw both cheetahs up close. This was my ‘must-see’ animal. They were beautiful, lean and looking for a kill. No kill for us to see though – we had to keep going. A few vehicles around the cheetahs had high-tech videographers in camoflouge and 3 foot long cameras. Hopefully, they got what they needed! Most predators were full and sleepy because there is soooo much food available at this time. We then headed to the Serengeti and as usual, had to wait for paperwork at the gate. The land was so vast and barren around the NP gate. Nobi Hill was at the gate and Ben and I took the chance to get a panoramic picture here at the top of the hill. The daylight was starting to diminish and so we focused on getting to our next campsite. On the way there, we saw another pride of lions on a rock, a line of hyenas, a giraffe walk between our vehicle and another, and a ‘pool’ full of hippos. Shortly after arriving in the camp, we ate quickly and headed to the washroom to prepare for bedtime. These guys are pretty cool up close. Big male. On the way to the bathroom, a very large hyena crossed our path – it was roughly 10 feet ahead of us, and about 4 feet away from a guy backing out of his tent. We shone our headlamps on him, as we were told to do, and the hyena sauntered off. He started to howl in the bush and we would see his wide-set eyes in the distance, as our light shone on him. Many of the other tourists were not impressed and somewhat concerned. One guy and two girls wanted me to walk them back to camp with my headlamp on even! Glad I wasn’t the only one freaked out…Ben kept thinking it was just pretty cool. We would hear the yipping throughout the night. 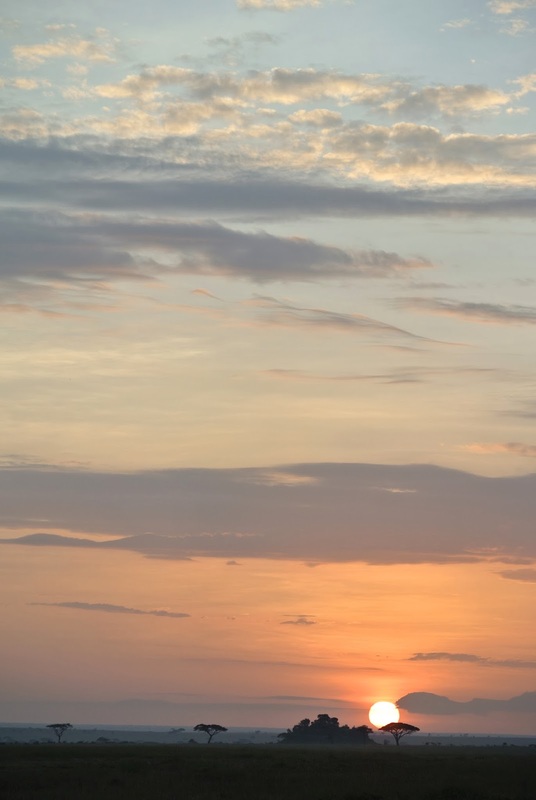 Serengeti…just mind blowing the vastness. 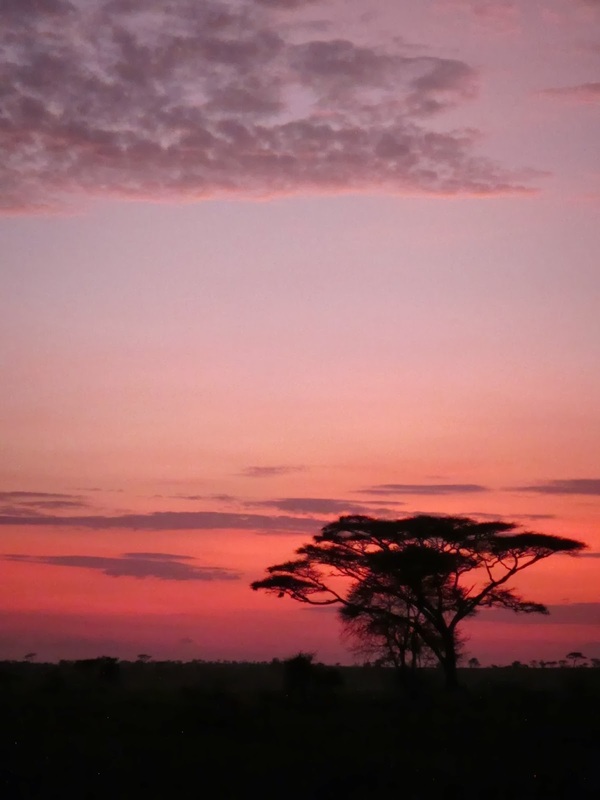 Pano of the sun setting in the Serengeti. Not bad pic for a truck moving on gravel/dirt at 60kph. Today we arose at 6am…no breakfast, we went straight to driving to watch the sunrise and catch any animals on the prowl before the day became too hot. The sun was very large and came up so quickly. It really was very beautiful. Again, our camera didn’t always catch the moment. During the drive, we saw an elephant on a hill under a tree. Almost like something out of a kids reading book. Then we saw another pride of lions. There was a lot of driving on this day with minimal animal viewings initially. We would drive around some bouldered areas (can’t remember technical name…think of that big rock on “The Lion King” movie) but could not find any lions. As there was a rain storm the day before, the lions typically respond by hitting the rocks and avoiding the low, wet-ground. Still, nothing was seen. At one point, we saw a crocodile but only one. Early morning in the Serengeti. Continuing on our drive, Ben had noticed a truck near us with the front left tire wobbling loose at a weird angle. We stopped to help. Two for two on days with trouble around us that we needed to stop to help. This time, however, the trouble was real. While the guides tried troubleshooting with the other driver (note: everyone only had a driver, we also had 2-3 ‘staff’), Ben and I had a picnic breakfast in the truck. The long grass around us meant there could be Simba (lion) on the prowl. The truck in front of us kept going. We found it not far away with the wheel fallen off. Needless to say, our two man trip turned into a six tourist tour quickly. Our truck was full and we were doing the Serengeti with more than a full vehicle (2 girls sitting in areas not meant for tourists). Instead of returning to camp, we continued to view wildlife (Ben was not to impressed with the added company). Someone else with issues. This one was serious, and we ended up taking 4 20-something volunteer girls with us….Ben was not impressed! At least someone was there to help - that could have been a horrible day for the girls. Up close action…he was a curious hyena. Terrified Jen - she thought he was going to leap on the truck and jump into our area. The coolest thing was then seen…we first saw people looking at a distant tree. A leopard was resting with a paw dangling down off the branch. No body could be seen but we watched the dangling leg eagerly and hopefully. Nothing happened. We continued our search and then we saw it, a leopard on the prowl. Unfortunately, there were 20 vehicles surrounding the leopard. This with the 4 '20-something' girls in the truck with us, the area was small, the view was always blocked - Ben was not a happy camper. The leopard itself had a regale look to it, and I could see why it was one of the more popular animals to spot. Apparently it is also quite rare to find these cats on the prowl mid-morning. We were hoping it would jump up a tree but it just kept walking….with 20 vehicles start-stopping and honking to get a view for the tourists. The hard to find leopard…once found…everyone hears about it…it's a big deal. We grew tired of the other trucks swarming around us, so we decided to get the heck out of there and head back to camp. 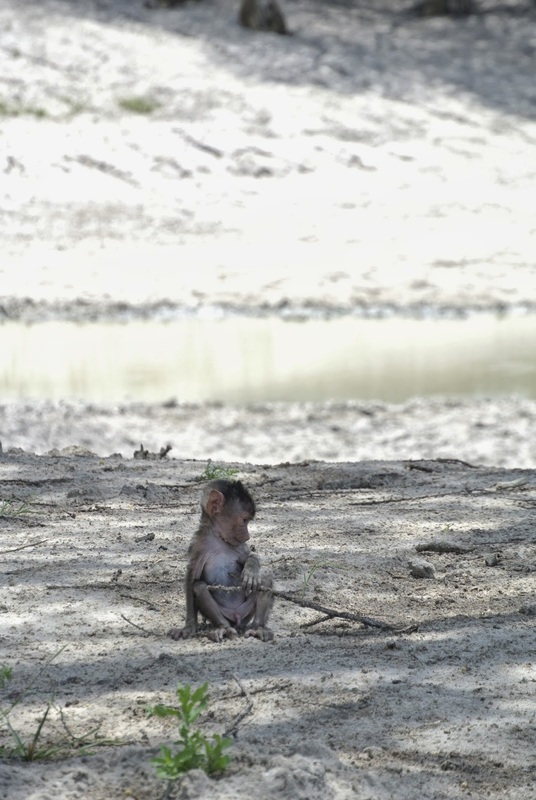 On the way back, we stopped to look at a baby monkey on the side of the road. He was so cute….almost putting a show on for us…until out-of-no-where, a larger monkey jumped INTO our truck and grabbed all of my crackers. Before we had a chance to react, he was gone. It was a memorable experience. This was right after a monkey jumped into our Jeep and stole all of Jen's crackers. 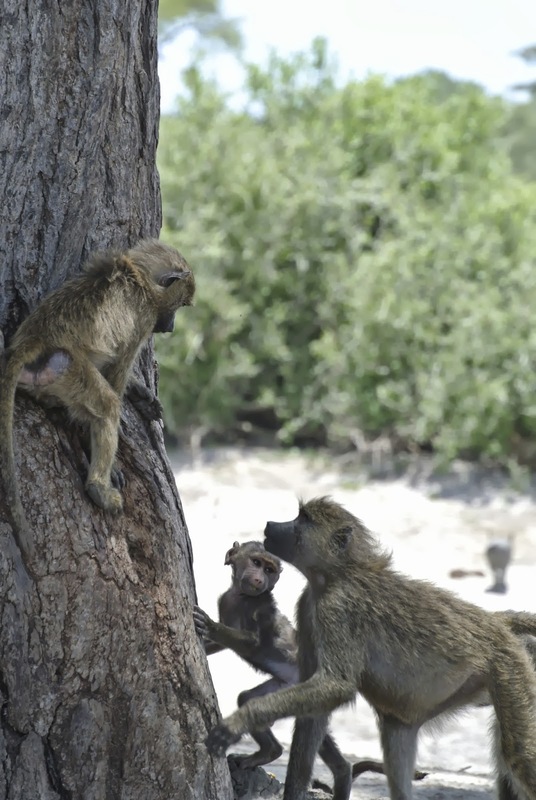 He didn't even share with the others….cheeky monkey. We dropped off the girls back at camp, quickly had one of Ben’s favorite lunches (Pizza, mango salad, and fries), and we were off for some 'semi-luxury' (read: bed and hot shower) at the Ngorongoro Wildlife Lodge….a lodge on the edge of the famous crater. Most of the hour or so of driving was navigating through migrating wildebeest. Still mind-blowing experiencing something like that. When we finally arrived at sunset, 2 ladies took our bags and cleaned them, and 2 came and gave us lemon infused cold towels and fruit juice…just what we needed. On our way home…one last quick photo op at the Serengeti gate. Our view from our Crater Lodge! The hard to find rhino! Extremely endangered. Later we saw 2 more…but there were very far away. Ngorongoro Crater is an extremely unique ecosystem. Just driving down into it, you know it is something special. The massive crater is able to hold such a large array of species in it. As we reached the bottom, a large pride of lions, Water buffalo, wildebeest, zebras, antelope, and elephants were all visible. Our mission: find the endangered black rhino! What the crater is truly known for is the extremely endangered Black Rhino. Five minutes into the tour, we saw our first Black Rhino. Today was our lucky day! It wasn’t too close to the vehicle, but we took what we could. We then drove into a small wooded area, which had a huge elephant family…20+. There were really small babies, and some mean old males. One wouldn’t get off the path. It had a broken off tusk and started coming our way. Our guide told us to be very quiet as he was an unpredictable one. Pretty intense! Two small elephants were even fighting each other. We wanted to stay but they all started making noises and after three warnings, they would attack the truck. We continued for awhile longer, then we pulled over for a quick picnic breakfast, and were off again to continue the loop around the crater. Come to think of it, we almost saw every African animal you could think of in there except the giraffe. 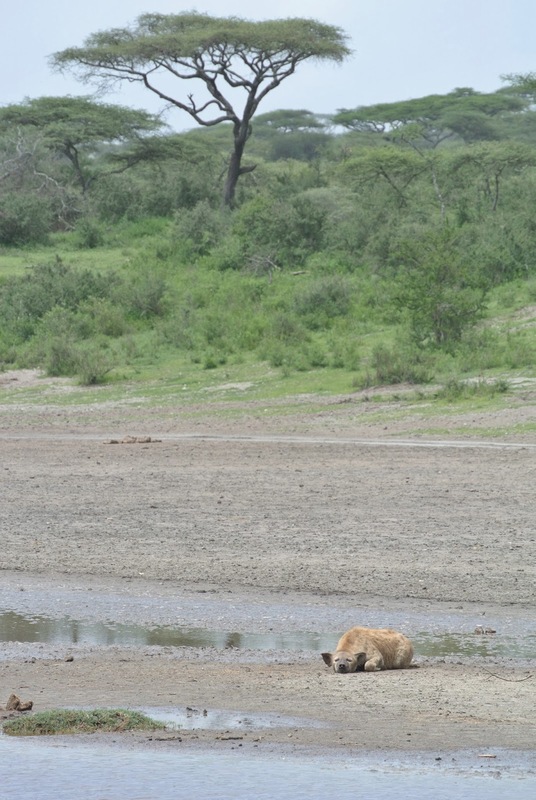 We then hit the jackpot and spotted a mother lion with 2 brand new cubs…maybe a few weeks old. They were adorable! On our way to 2 more Black Rhinos we could see a mile away, we spotted a male lion and female mating. Our guide told us this was a rare site for a tourist to see this…lucky us ;). A few more hours of hippos, birds, hyenas, and more, we were done, and ready to head back to get ready for Zanzibar. Our driver told us to be very still and quiet because this male had a bad attitude…missing tusk…looked pissed off. We had to wait for this fight to finish before we could pass. Hooded cranes - Jen loved these guys! Apparently a rare site for any tourist to see. The next 5+ hours of driving sucked. When we arrived at Arusha (small city), the only words I could use to describe what we saw was “controlled mass confusion”. We were told to hide our belongings again as we had to drive through a few rough neighborhoods. Always reassuring. The Honey Badger was yet again a welcome sight!